INGOLSTADT, Germany (Reuters) - Audi is turning more gloomy about the chances of growing earnings next year due to weakening European markets, potentially making it harder for parent Volkswagen Group to meet its goal of lifting profits in 2013. Audi, VW's biggest profit generator, believes it could take two to three years for auto sales to return to growth in austerity-stricken Europe, where it sells half of its cars, CEO Rupert Stadler told Reuters. "The wind out there is becoming much harsher," Stadler said in an interview at the carmaker's headquarters in Ingolstadt, southern Germany. "Customers all over Europe are unnerved" by the effects of the debt crisis, he said. Stadler has become more pessimistic during the fourth quarter on the business outlook in Europe. At the Paris auto show in September, he said it was possible Audi's core markets might only stagnate for the next one or two years. Audi vehicle sales in Germany and Europe as a whole fell in November, shrinking 4.3 percent and 1.9 percent respectively, after gains of 5.1 percent and 4.2 percent the month before. Asked whether Audi's expectation of increasing vehicle sales next year would translate into a higher 2013 operating profit, the CEO said he would not put his money on it today. Audi increased nine-month profit 6 percent to 4.2 billion euros, almost half the 8.8 billion of parent VW, whose eight passenger-car brands include sports-car maker Porsche and Czech arm Skoda. A failure by VW's flagship brand to increase earnings next year could hamper efforts by VW to achieve its goal of raising 2013 group profit above last year's record 11.3 billion euros. This year, VW is bracing for flat earnings because of spending on a new technology for building small and mid-sized vehicles. Stadler said Audi would post a smaller increase in global auto sales in December than the 10.9 percent gain, or 123,600 vehicles, reported in November, due partly to fewer work days. Record sales this year in the United States and China will offset weakness in Europe and drive global deliveries beyond 1.4 million cars and SUVs, the CEO said. Audi may achieve 1.5 million sales, a goal originally set for 2015, next year or by 2014, he added. 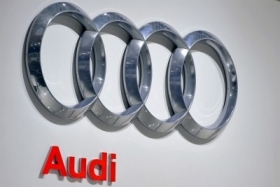 Audi, aiming to surpass German rival BMW as the world's biggest luxury car maker, may increase overseas production and is looking at Brazil and Asia, Stadler said. "All (car) manufacturers are working intensively to improve their market potential in those countries," he said. The share of Audi's two main Germany-based plants in Ingolstadt and Neckarsulm of the brand's global production may drop below 50 percent by 2017 as Audi's global output swells to 1.87 million vehicles. A big chunk of new production will go to new factories in Mexico and China as well as expanded facilities in Hungary and China, according to research firm IHS Automotive.